So far an unproven quote, re Montgomery: “In defeat, indomitable; in victory, insufferable.” With Monty at the Rhine, 1945 (Brooke is between them). 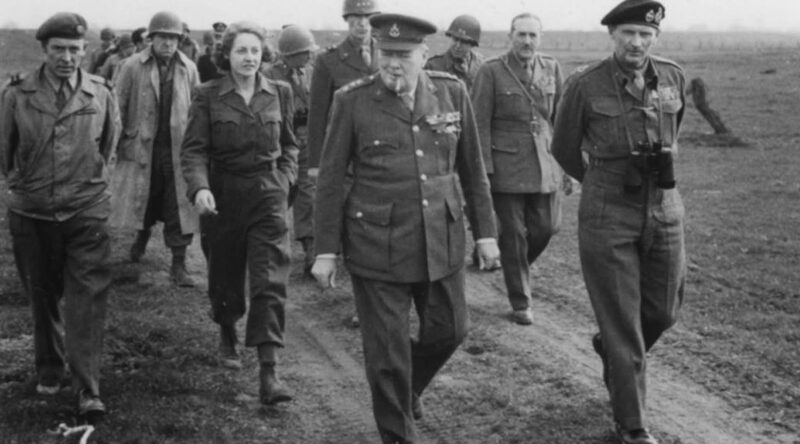 At left, the Daily Mail’s Rhona Churchill (no relation), first female correspondent during the invasion of Europe. Red Her­rings: Quotes not by Churchill (or things he said quot­ing some­one else), con­tin­ued from Part 2. Com­piled for the next expand­ed edi­tion of Churchill by Him­self. Is Wikipedia right that Churchill admired Ital­ian dic­ta­tor Ben­i­to Mus­soli­ni for hav­ing the “good sense to shoot his son-in-law”? It’s a great crack, but it is not ver­i­fied.